differencemakers community blog: Handling Appraisals: A Leadership Challenge? Appraisals are tough time for any leader. Not only does he have to face his team members whom he has interacted with so closely for the past year in sharing common goals and drawing their best from them to achieve the set targets, he has to first start by handling his/her own appraisal results. Over the past 24 years, I have worked in an environment where the year's hard work translates into a setback for most employees, whether due to the steep pyramid-like hierarchy in the Army or the Bell Curve Method of Appraisal in the Corporate. The manner in which a leader reacts to his/her own appraisal sets the norm for rest of the team indirectly, as the team members tend to exhibit similar behavior due to the mirroring effect. It is very painful for a leader who has been demanding the best results for his/her team to discover that his/her own performance fell short of the expectations of the organization. At the same time, due to exuberance, many leaders after being rated as a top performers, fall into the trap of displaying behavior that takes the entire credit for the excellent rating. Either way, the teams under them will get conflicting signals that will spiral into deeper frustration. 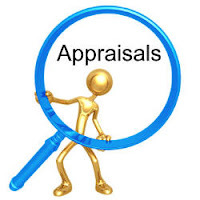 Excellent Appraisals - Give Credit to Your Team. You have every right to enjoy the moment that is culmination of your hard work. However, the rating is also a measure of contribution made by your team. Make your success a measure of the team's collective performance and express your gratitude to the team publicly. Not only will your team share your happiness, it will give them inspiration. Average Appraisals - Display the 'Never Give Up' Behavior. Throughout the past year, you have been egging your team to deliver on each project/task, coaxing and mentoring them to tide over challenges and obstacles, now its your turn. Remember, the next financial year has already started, and you have goals ahead of you. Before the Meeting. Make sure that the location allows meaningful and respected discussion, with no interruptions. This appointment should not coincide with a period of great work urgency. Give sufficient notice to the team member for sound preparation and allocate sufficient time to do the occasion justice. During the Meeting. Go through the job profile along with the goal sheet of the employee. Highlight the real priorities and recall if there have been changes in targets, methods and/or people. Also recall the general performance level of the employee during the period and recollect details of any highs/lows in performance. Consider if employee needs more knowledge or increased skill and recall any other known need. Prepare some key points to make and key questions to ask. At the Meeting. Give due recognition for good outcomes in performance and put shortfalls in context of the total job. Keep in mind that the purpose of performance review is to move towards improvement in job performance and personal attributes, hopefully on a joint basis. Remain watchful for reactions of any kind to all that happens at the meeting and then respond appropriately. Keep a firm grip on own emotions. Finally, if after reasonable attempts you cannot get the employee back to normal behavior defer the meeting to another occasion. This delivers a message to the effect that both the outstanding business and the breakdown in communication will still be addressed. After all, you as the appraiser are, or will be, in ultimate control. Use ‘I’ language. The employees should speak for themselves and express feelings and opinions clearly. Direct Criticism. The criticism should be directed at something said or done. It should not take the form of a personal attack. Tell Consequences of Action. The employee should be told exactly and concrete terms what has been done or left undone and what the consequences were. Identify Behavior Changing Possibility. The criticism should be directed at something the employee has the possibility of changing in the future. He/she must be given the chance to express feelings and explain behavior.